Another possible reason, why it feels like a replica of New Year’s Eve, is that people are going out to celebrate and there are dance parties all over town. Plus, the next day is a holiday. Here in Germany we celebrate the upcoming season with the so called “Dance into May” or “May ball” (whatever you think is the better translation). The only two things that are different from New Year’s are that you don’t need snow shoes (usually) on your way home and you don’t need to hug and/or kiss weird foreign and/or drunk people, after counting down to zero at midnight… unless you wish to. In most cases there is no firework either, so this is a difference, too. Anyhow, I always felt like this is another New Year’s.. so…Happy New Year.. or Happy New Summer? hmm.. let’s stick to that! I was not out celebrating last night (I spent 10 hours on a train and my preferred dance floor was my bed.. the dances took place in my dreams), but I would like to welcome the month of May. Let’s celebrate the upcoming season with a cake that fulfills the requirements of light summer taste and the feeling of sunshine and freshness. That is pretty much it, when it comes to the lemon filling. 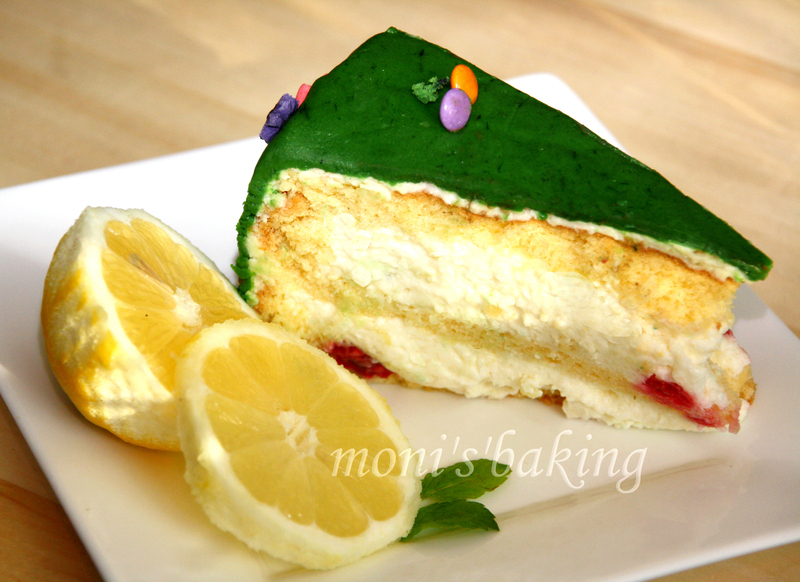 I usually use it with a sponge cake, which I cut into three layers. Last time I put fresh rasberries onto each layer and put the filling on top. The lemon and the rasberries are really great together and it sure tastes like summer. It is a treat and super easy and fast to make. The filling is light and fresh and therefore the right choice for any summer celebration. You can use it with sponge cake (which is the lightest version, that is why I like it so much.. it just fits), pound cake or any other cake.. or as a dessert. With layers of fresh fruit and this cream, I am sure this dessert will be a summer explosion to your barbecue or dinner with friends and family. Nothing left to say except.. welcome May!